The fusion between Goku and Vegeta to counter Majin Buu using the “Potara”, a sacred artifact of the Supreme Kai, is now available in the Figure-rise Standard series! Vegito’s iconic colored clothing, gloves, and shoes have been recreate using colored parts. 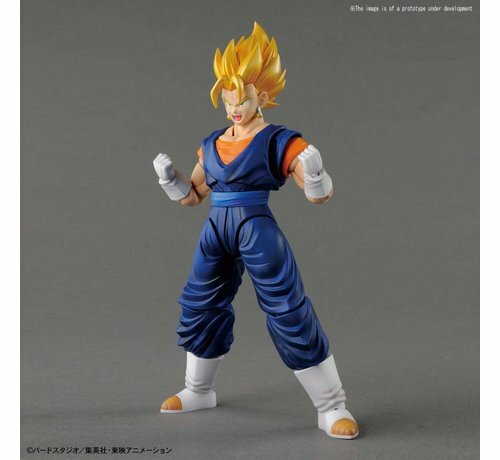 Boasting a wider range of articulation that no other Figure-rise Standard kit has seen before, Vegito can achieve a multitude of poses allowing you to recreate your favorite scenes from the series! Even better, is the included 450mm (approx. 17.7 in) Vegito sword! 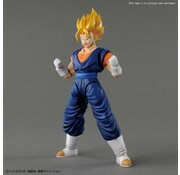 An impaled Buu (2.5” tall; unpainted) is included in this set, and by using forced perspective, you can arrange this kit to accurately mimic this memorable moment in the heat of battle! Set includes 2 facial expression parts (1 normal & 1 shouting), 7 hard parts x1 each, and a Finisher effect. Runner x10. Sticker sheet x1. Instruction manual x1.